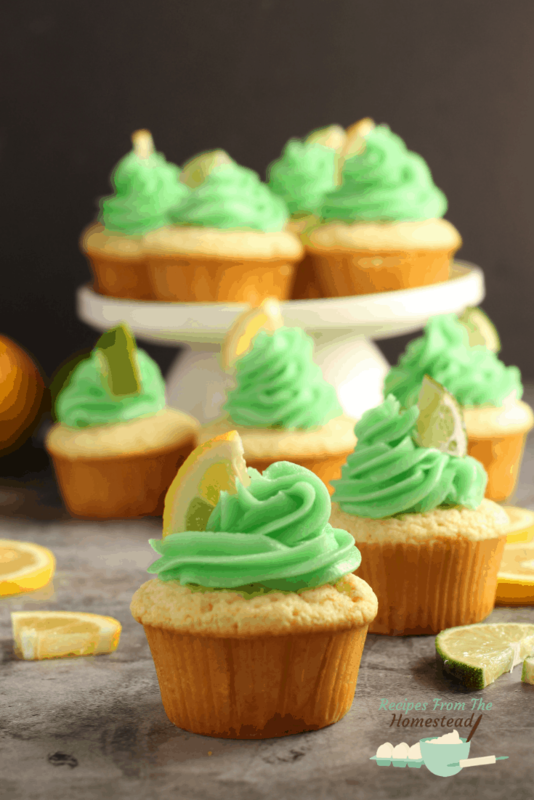 Sweet, with just a bit of tangy flavor, these lemon lime cupcakes are tender, tasty and festive! In our home, birthdays are very festive. The birthday boy or girl gets to choose all the meals for the day, all the entertainment, as well as the cake flavor. 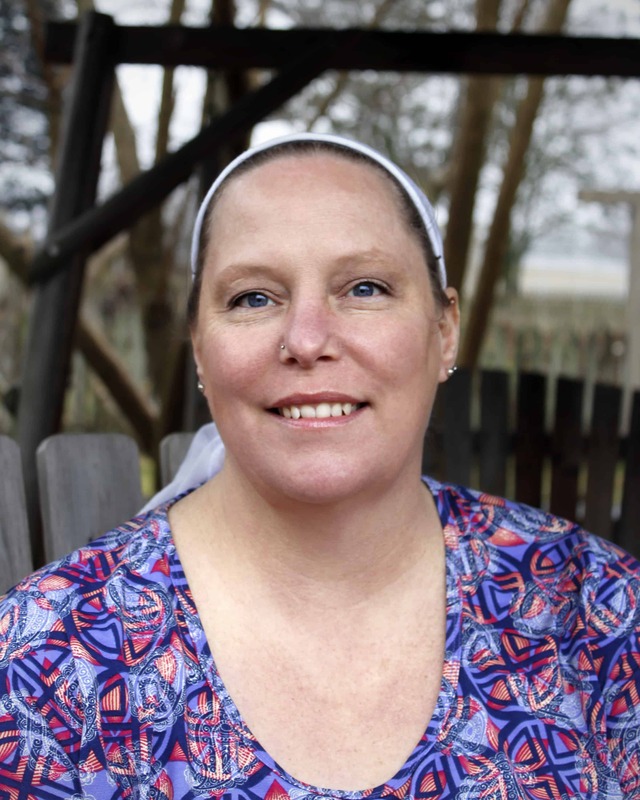 I have made all types of flavors in the past, from lemon cake with strawberry frosting, to Oreo ice cream cake with blue frosting to Boston Creme Pie. Some are stranger combinations, some are standard. Each one unique for the special person. When the boy was on the cusp of turning 14, he loved the idea of citrus. Lemon this, lime that. He could easily eat lime curd by the batchful. I knew his birthday cake was going to be different this year. Something citrus, not overly sweet. And fun. It HAS to be fun. I was all for the fun, and all for the citrus. 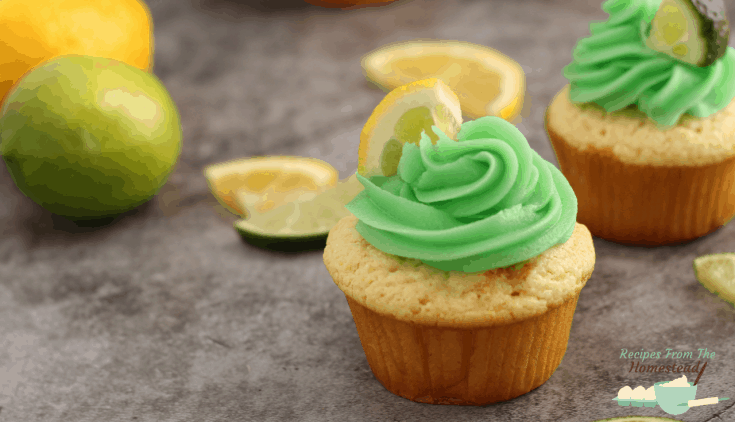 Thus, was born lemon lime cupcakes. Originally, he wanted a layer cake that had lemon on the top, lime on the bottom and strawberry frosting in the middle. Hey, he’s 14 and flavor combinations like that are the norm, right? Wanting to make his birthday more festive, I went with cupcakes. 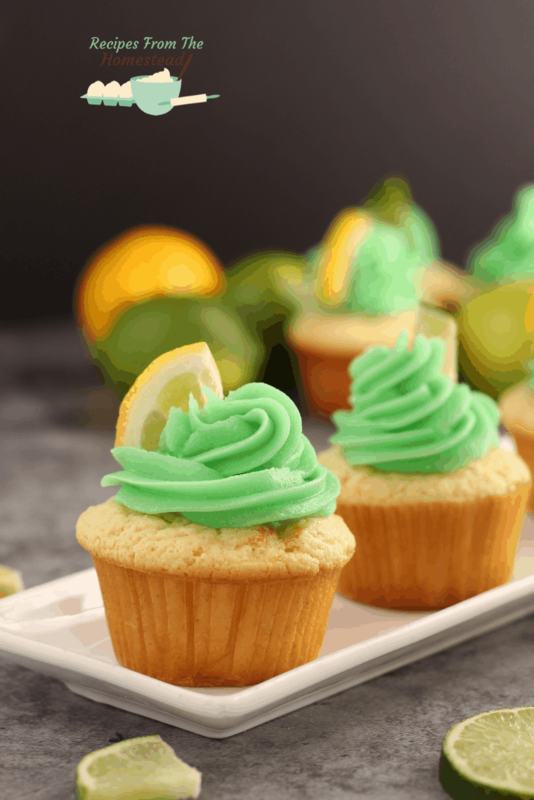 Lemon lime cupcakes have a tender, lemony cake with lime curd filling. 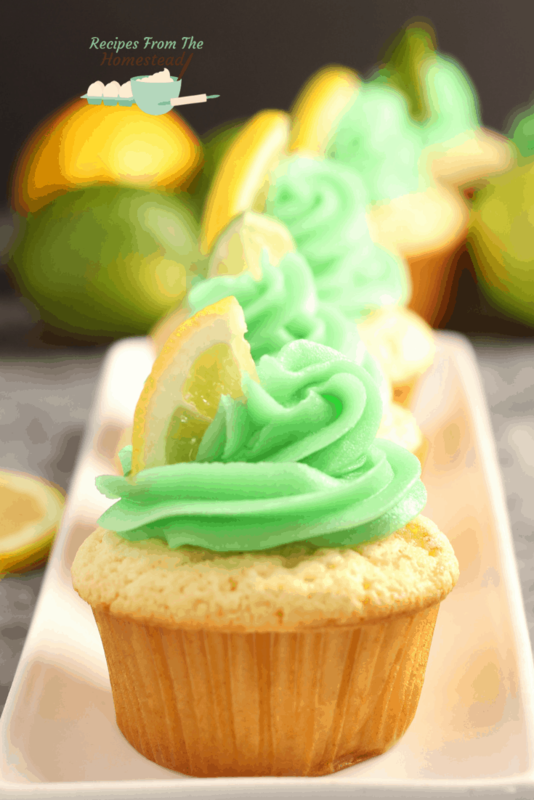 The frosting is also lime flavored, giving all the citrus flavors he was going for. All in an easy to control portion size. This one was a total winner with the rest of the family, too. I’m not saying lemon cake with strawberry frosting is bad at all, but it WAS nice to get a break from that this year. Just saying. In a separate bowl, beat butter and sugar together until fluffy. Add eggs and yolks, one at a time, blending well after each addition. Add in bottled lemon juice. Alternating, starting with flour, add in sour cream and flour mixture. Pour 1/2 cup batter into each cupcake liner. Bake for 18-22 minutes, until toothpick comes out clean. Once cool, carefully remove a small part of the cake in the middle, using an apple corer or spoon. Fill hole with lime curd. In a clean medium sized bowl, add in softened butter and powdered sugar. Stir in lime zest and juice. 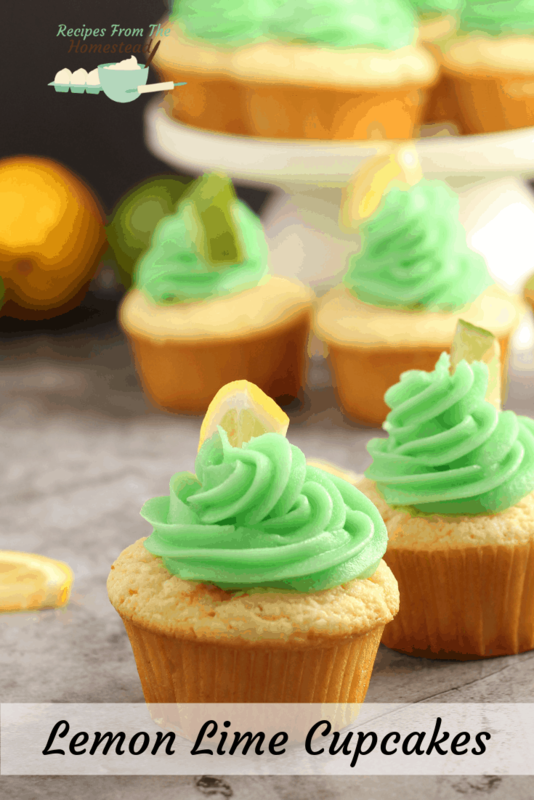 Decorate with lemon or lime slices and sprinkle additional zest, if desired. What is your favorite birthday cake flavor? 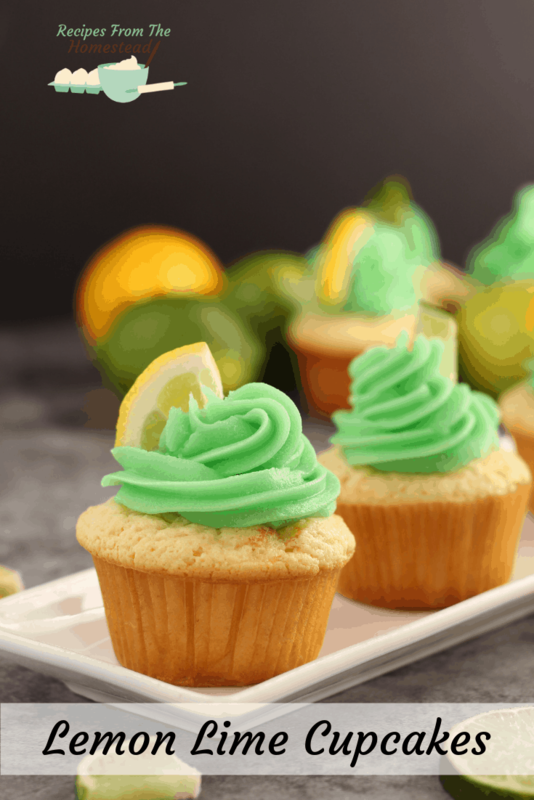 Will you try these lemon lime cupcakes? Be sure to pin this for later!